77-13-5. Excavator’s investigation of site; notice to utility of planned excavation. 77-13-7. Notification of damaged lines. 77-13-9. Marking location of underground facilities; timeliness. 77-13-11. Exceptions to advance notice requirement. 77-13-13. Advance notice as relieving excavator of certain liabilities. 77-13-15. Notice to one-call system. 77-13-23. Operator waives right to recover damages to operator’s underground facilities under certain circumstances; exemption. It is the intent of the Legislature to protect underground utility facilities and other underground facilities from destruction or damage, in order to prevent death of or injury to persons, property damage to public and private property, and loss or interruption of essential utility services to the general public. HISTORY:SOURCES: Laws, 1985, ch. 494, § 1; reenacted without change, Laws, 1999, ch. 302, § 1, eff from and after July 1, 1999. (a)“Abandoned facility” means any underground utility line or underground utility facilities no longer used in the conduct of the owner/operator’s business and are not intended to be used in the future. (b)“Approximate location of underground utility lines or underground facilities” means information about an operator’s underground utility lines or underground facilities which is provided to a person by an operator and must be accurate within eighteen (18) inches measured horizontally from the outside edge of each side of such operator’s facility, or a strip of land eighteen (18) inches either side of the operator’s field mark, or the marked width of the facility or line plus eighteen (18) inches on each side of the marked width of the facility or line. (c)“Board” means the Underground Facilities Damage Prevention Board, created by Section 77-13-29. (d)“Calendar day” means a twenty-four-hour period. (e)“Commission” means the Mississippi Public Service Commission. (f)“Damage” means the substantial weakening of structural or lateral support of underground utility lines and underground facilities, penetration or destruction of any protective coating, housing or other protective devices of an underground utility line or underground facility, and the partial or complete severance of any underground utility line or underground facility, but does not include any operator’s abandoned facility. (g)“Design Information Request” means a notification made to Mississippi 811, Inc., by a person providing professional services and making a request in preparation for bidding, preconstruction engineering, or other advance planning efforts that do not involve excavation. A design information services request may not be used for excavation purposes. (h)“Emergency excavation” means excavation at times of emergency involving danger to life, health or property or a customer service outage. (i)“Excavate or excavation” means any operation in which earth, rock or other material or mass of material on or below the ground is moved or otherwise displaced by any means, except: (i) the tilling of the soil less than twenty-four (24) inches in depth for agricultural purposes; or (ii) an operation in which earth, rock or other material or mass of material on or below the ground is moved or otherwise displaced to a depth of less than twelve (12) inches on private property by the property owner without the use of mechanical excavating equipment; or (iii) an operation in which earth, rock or other material or mass of material on or below the ground is moved or otherwise displaced without the use of mechanical excavating equipment to a depth of less than twelve (12) inches on private property by an excavator who is not the property owner, except when such excavation is in a clearly marked underground facility right-of-way; or (iv) routine railroad maintenance activities conducted within the track structure, drainage ditches, or within the railroad right-of-way a distance not to exceed thirty (30) feet from the outside rail of the outermost track or tracks, provided this work is performed by railroad employees or railroad contractors and is carried out with reasonable care so as to protect any underground facilities properly installed in the railroad right-of-way by agreement with the railroad; or (v) routine activities of a cemetery, provided that for any cemetery that begins or expands after July 1, 2015, such activities occur only after initial notice is provided to Mississippi 811, Inc., and all affected operators have advised that there are no underground facilities within the boundaries of the subject cemetery; or (vi) routine maintenance activities carried out by or for those responsible for publicly maintained roadways and rights-of-way, provided that the activities occur entirely within the public right-of-way and do not penetrate the earth to a depth of more than twelve (12) inches and are carried out with reasonable care so as to protect any underground facilities placed in the right-of-way. Routine maintenance activities shall be more specifically described in the rules and regulations adopted by the board; or (vii) the driving of wooden stakes by use of hand tools which do not penetrate the earth to a depth of not more than six (6) inches. The term “excavate” shall include, but not be limited to, the operations of demolition, blasting, grading, land leveling, trenching, digging, ditching, drilling, augering, tunneling, scraping, cable or pipe plowing, driving, jacking, wrecking, razing, rending, moving or removing any structure or other material or mass of material on or below the ground. (j)“Excavator” means any person who engages directly in excavation. 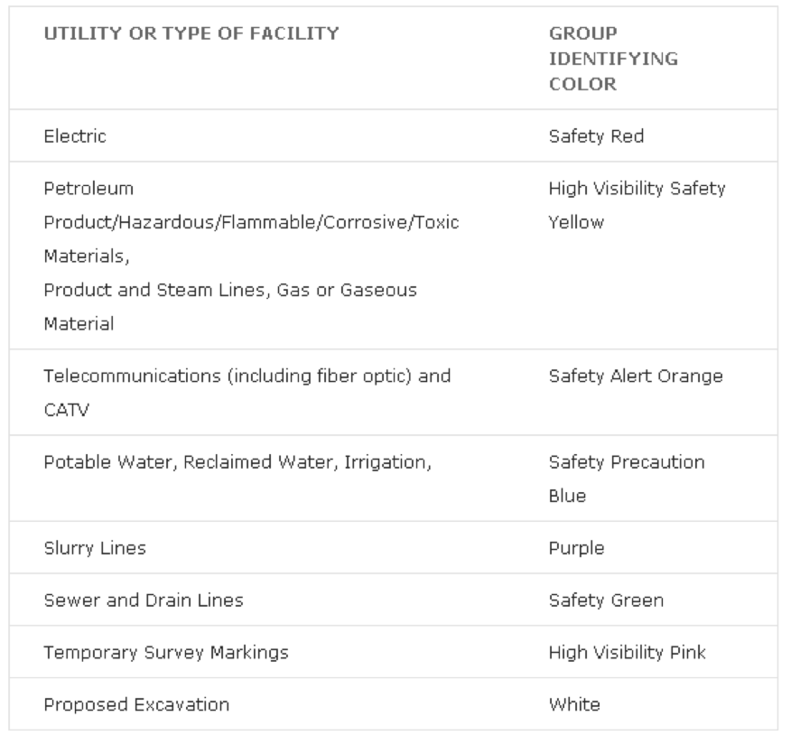 (k)“Mark” means the use of stakes, paint or other clearly identifiable materials to show the field location of underground facilities in accordance with the current color code standard of the American Public Works Association, or the uncovering or exposing of underground facilities so that the excavator may readily see the location of same, or the pointing out to the excavator of certain aboveground facilities such as, but not limited to, manhole covers, valve boxes and pipe and cable risers, which indicate the location of underground facilities. (l)“Mechanical excavating equipment” means all equipment powered by any motor, engine, or hydraulic or pneumatic device used for excavating and shall include, but not be limited to, trenchers, bulldozers, backhoes, power shovels, scrapers, draglines, clam shells, augers, drills, cable and pipe plows and other plowing-in or pulling-in equipment. (m)“Mississippi 811, Inc.” means a nonprofit corporation organized under the laws of the State of Mississippi that provides a service through which a person shall notify the operator(s) of underground facilities of plans to excavate and request marking of facilities. (o)“Operator” means any person who owns or operates a utility. However, the term “operator” shall not include any railroad or the Mississippi Department of Transportation. (p)“Person” means any individual, firm, partnership, association, trustee, receiver, assignee, corporation, entity, limited liability company, utility, joint venture, municipality, state governmental unit, subdivision or instrumentality of the state, or any legal representative thereof. (q)“Pipeline Safety Division” means the Pipeline Safety Division of the Public Service Commission. (r)“Positive response information system” or “PRIS” means an automated information system operated and maintained by Mississippi 811, Inc., that allows excavators, locators, facility owners or operators, and other affected parties to enter and/or determine the status of a locate request. (s)“Underground facility” means any underground utility lines and other items which shall be buried or placed below ground or submerged for use in connection with underground utility lines and including, but not be limited to, pipes, sewers, conduits, cables, valves, lines, wires, manholes, vaults, attachments and those portions of poles below the ground. (t)“Underground utility lines” means underground or buried cable, conduit pipes and related facilities for transportation and delivery of electricity, telecommunications (including fiber optics), water, sewage, gas, mixtures of gases, petroleum, petroleum products or hazardous, flammable, toxic or corrosive liquids. (u)“Utility” means any person who supplies, distributes or transports by means of underground utility lines or underground facilities any of the following materials or services: gas, mixture of gases, petroleum, petroleum products or hazardous, toxic, flammable or corrosive liquids, electricity, telecommunications (including fiber optics), sewage, drainage, water, steam or other substances. (v)“Working day” means a twenty-four-hour period commencing from the time the locate request is processed or entered into the system by Mississippi 811, Inc., in accordance with this chapter, excluding Saturdays, Sundays and legal holidays. HISTORY:SOURCES: Laws, 1985, ch. 494, § 2; Laws, 1997, ch. 483, § 1; reenacted without change, Laws, 1999, ch. 302, § 2; Laws, 2008, ch. 497, § 1; Laws, 2009, ch. 382, § 1; Laws, 2010, ch. 427, § 1; Laws, 2014, ch. 354, § 1; Laws, 2015, ch. 309, § 1; Laws, 2016, ch. 490, § 1, eff from and after July 1, 2016. (b)Plan and conduct the excavation to avoid or minimize interference with or damage to underground utility lines and underground facilities in or near the excavation area; maintain a clearance between any underground utility line or underground facility and the cutting edge or point of any mechanical excavating equipment, taking into account the known limit of control of such cutting edge or point, as may be reasonably necessary to avoid damage to such facility; and provide such support for underground utility lines or underground facilities in and near the excavation area, including during any backfilling operations, as may be reasonably necessary for the protection of such facilities. (c)Except as provided in Section 77-13-11, provide not less than two (2) and not more than ten (10) working days’ advance written, electronic or telephonic notice of the commencement, extent, location and duration of the excavation work to Mississippi 811, Inc., so that Mississippi 811, Inc., operator(s) may locate and mark the location of underground utility lines and underground facilities in the excavation area. The written, electronic or telephonic notice required by this paragraph (c) shall contain the name, address and telephone number of the person filing the notice of intent, the person responsible for the excavation, the starting date, anticipated duration, type of excavation to be conducted, the location of the proposed excavation and whether or not explosives are to be used. (2)The markings provided by operators and the locate request number shall only be valid for a period of fourteen (14) calendar days from the date and time the locate request ticket is processed or entered into the system by Mississippi 811, Inc. The person responsible for the excavation project shall renew the notification with Mississippi 811, Inc., at least two (2) and not more than three (3) working days prior to this expiration date and shall continue to renew such notification in the same manner throughout the duration of the excavation. Such renewal notice shall be valid for a period of fourteen (14) calendar days from the date and time the renewal locate request is processed or entered into the system by Mississippi 811, Inc.
(3)Compliance with the notice requirements of this section shall not be required of: (a) persons plowing less than twenty-four (24) inches in depth for agricultural purposes; (b) persons who are moving or otherwise displacing, by hand, earth, rock or other material or mass of material on or below the ground at a depth of less than twelve (12) inches on property they own; and (c) persons, other than the property owner, who are moving or otherwise displacing, by hand, earth, rock or other material or mass of material on or below the ground at a depth of less than twelve (12) inches, except when such excavation is in a clearly marked underground facility right-of-way. (4)A person may make a written, electronic or telephonic design information request to Mississippi 811, Inc., so that owners and operators of utilities may locate underground utility lines and underground facilities in the design information area. The design information request shall contain the name, address, and telephone number of the person making the request, the type of project planned, and a description of the area to be located with sufficient particularity to enable the utility owner or operator to ascertain the precise tract or parcel of land involved. HISTORY:SOURCES: Laws, 1985, ch. 494, § 3; Laws, 1997, ch. 483, § 2; reenacted without change, Laws, 1999, ch. 302, § 3; Laws, 2008, ch. 497, § 2; Laws, 2015, ch. 309, § 2; Laws, 2016, ch. 490, § 9, eff from and after July 1, 2016. (1)Each person responsible for any excavation that results in damage to an underground utility line or underground facility, immediately upon discovery of such damage, shall notify Mississippi 811, Inc., and notify all operators of such damaged line or facility of the location of the damage and shall allow the operator reasonable time to accomplish any necessary repairs before completing the excavation in the immediate area of the damage to such line or facility. (2)Each person responsible for any excavation that results in damage to an underground pipeline or underground facility permitting the escape of any hazardous, flammable, toxic or corrosive gas or liquid shall, immediately upon discovery of such damage, call 911 and then notify Mississippi 811, Inc., and the operator and take other action as may reasonably be necessary to protect persons and property and to minimize the hazards, until arrival of the operator’s personnel and the police or fire departments. (3)Except where the excavator has fully complied with the provisions of Section 77-13-5 and subsections (1) and (2) of this section, each person responsible for excavation that results in damage to an underground line or underground facility, except the property owner, unless the property owner is the excavator, shall be responsible for any and all costs and expenses incurred by the operator in restoring, correcting, repairing or replacing the damaged line or facility. HISTORY:SOURCES: Laws, 1985, ch. 494, § 4; Laws, 1997, ch. 483, § 3; reenacted without change, Laws, 1999, ch. 302, § 4; Laws, 2008, ch. 497, § 3; Laws, 2009, ch. 382, § 2; Laws, 2016, ch. 490, § 8, eff from and after July 1, 2016. (1)Every person owning or operating underground utility lines or underground facilities shall, upon receiving advance notice of the commencement of excavation, in accordance with Section 77-13-7, make an investigation, and may report through the use of the PRIS the status of the work performed, within two (2) working days from the time notice is provided in accordance with this chapter to Mississippi 811, Inc., to determine the approximate location of its underground utility lines or underground facilities in the area of the proposed excavation, and shall either: (a) mark the approximate location of underground utility lines and underground facilities in or near the area of the excavation, so as to enable the person engaged in excavation work to locate the lines and facilities in advance of and during the excavation work; (b) advise in writing or by telephone or electronic means that it has no underground utility lines or underground facilities in the excavation area; or (c) advise in writing or by telephone or electronic means that it can locate its underground utility lines or underground facilities in the excavation area only by excavation. If an operator can locate its underground utility lines or underground facilities in the excavation area only by excavation and has given proper notice of such, that operator shall be allowed a reasonable amount of additional time, not to exceed four (4) working days from the day the original notice was provided in accordance with this chapter, to mark the approximate location of the underground utility lines or underground facilities. (2)In lieu of such marking, the operator may request to be present at the site upon commencement of the excavation, so long as the operator complies within two (2) working days of the receipt of the notice. (3)When an excavator, upon arriving at an excavation site, sees evidence of unmarked underground utility lines or underground facilities or encounters an unmarked underground utility line or underground facility on an excavation site after excavation has commenced where notice of intent has been made in accordance with the provisions of this chapter, that excavator must immediately contact Mississippi 811, Inc. All operator(s) thus notified must contact the excavator within four (4) hours and inform the excavator of any of their known underground facilities, active or abandoned, at the site of the excavation. (5)All utility facilities installed by owners or operators of utilities on or after January 1, 2010, shall be installed in such manner that the utility facility may be located by using a generally accepted electronic locating method. (6)Except for emergency excavations, if, before the expiration of the two (2) working days’ waiting period, all identified facility owners or operators have responded to the locate request and all have indicated that their facilities are either not in conflict or have been marked as indicated through the use of the PRIS, then the person planning to perform excavation or blasting shall be authorized to commence work, subject to the other requirements of this section, without waiting the full two (2) working days. (7)Upon receiving a design information request, the utility owner or operator shall within seven (7) working days from the time notice is provided in accordance with this chapter to Mississippi 811, Inc., respond by one (1) of the following methods: (a) marking the approximate location of its underground utility lines and underground facilities in the area in accordance with subsection (1) of this section; (b) providing to the person making the design information request the best available description of its underground utility lines and underground facilities in the area which may include drawings or other records maintained by the utility owner or operator; or (c) allowing the person making the design information request or any other authorized person to inspect or copy the drawings or other records for all underground utility lines and utility facilities in the area. HISTORY:SOURCES: Laws, 1985, ch. 494, § 5; Laws, 1997, ch. 483, § 4; reenacted without change, Laws, 1999, ch. 302, § 5; Laws, 2008, ch. 497, § 4; Laws, 2009, ch. 382, § 3; Laws, 2010, ch. 427, § 2; Laws, 2015, ch. 309, § 3; Laws, 2016, ch. 490, § 10, eff from and after July 1, 2016. (1)The advance notice provisions of this chapter shall not apply to any person making an excavation at times of emergency involving danger to life, health or property or a customer service outage. However, every person who shall engage in such emergency excavation shall take all necessary and reasonable precautions to avoid or minimize interference with or damage to existing underground utility lines and underground facilities in and near the excavation area, and shall notify as promptly as reasonably possible the operators of underground utility lines or underground facilities in and near the emergency excavation area specifically designating whether such excavation is an emergency excavation as defined herein. In the event of damage to or dislocation of any underground utility lines or underground facilities caused by any such emergency excavation work, the person responsible for the excavation shall immediately notify the operator of the damaged or dislocated underground facilities of the damage or dislocation. (2)An imminent danger to life, health, property or customer service exists whenever there is a substantial likelihood that injury, loss of life, health or customer services, or substantial property loss could result before the person responsible for the excavation or demolition can fully comply with the notification and response procedures required in Sections 77-13-7 and 77-13-17. HISTORY:SOURCES: Laws, 1985, ch. 494, § 6; Laws, 1997, ch. 483, § 5; reenacted without change, Laws, 1999, ch. 302, § 6, eff from and after July 1, 1999. The act of giving notice in accordance with Section 77-13-5 shall relieve the notifying party of all liability to a utility should such notice be ignored or the information provided by the utility subsequent to said notice be materially inaccurate; provided, however, the act of giving advance notice and/or obtaining information as required by this chapter shall not relieve any person making excavations from doing so in a careful and prudent manner, nor shall it relieve such person from liability for any injury or damage proximately resulting from his/her negligence. HISTORY:SOURCES: Laws, 1985, ch. 494, § 7; reenacted without change, Laws, 1999, ch. 302, § 7, eff from and after July 1, 1999. Notification to Mississippi One-Call System, Inc., as provided in Section 77-13-5, may be effected by giving notice to Mississippi One-Call System, Inc., in writing, by telephone, fax or other electronic means made available through Mississippi One-Call System, Inc.
HISTORY:SOURCES: Laws, 1985, ch. 494, § 8; Laws, 1997, ch. 483, § 6; reenacted without change, Laws, 1999, ch. 302, § 8; Laws, 2008, ch. 497, § 5, eff from and after July 1, 2008. (1)Any operator who fails to follow, abide by or comply with this chapter shall be responsible for the cost or expense the excavator shall incur as a direct result of the failure of the operator to follow, abide by or comply with the provisions of this chapter. (2)Operators who have underground utility lines or underground facilities within the State of Mississippi shall be a member of Mississippi 811, Inc.
(3)The person giving notice of the intent to excavate to Mississippi 811, Inc., shall be furnished an individual locate request number for each notification and, upon request, shall be furnished the names of the operators to whom the notification will be transmitted. (4)An adequate record of all notifications shall be maintained by Mississippi 811, Inc., in order to document timely compliance with this chapter. These records shall be retained for a period of not less than four (4) years and shall be made available at a reasonable cost upon proper and adequate advance request. (5)The services of Mississippi 811, Inc., will be provided on working days as defined in Section 77-13-3(h) at least between the hours of 7:30 a.m. and 5:00 p.m.
(6)Mississippi 811, Inc., will voice-record the notification telephone calls and after-hour calls will at least reach a voice recording which explains emergency notification procedures. (a)A list of counties, cities and towns in which the operator has underground utility lines or underground facilities in each county. (b)A digital map, paper map or geospatial information showing the location of the operator’s underground utility lines or underground facilities or for other reasons wish to receive notification of proposed excavation. (c)An update on an annual basis of each operator’s underground utility lines or underground facilities for the State of Mississippi. HISTORY:SOURCES: Laws, 1997, ch. 483, § 7; reenacted without change, Laws, 1999, ch. 302, § 9; Laws, 2008, ch. 497, § 6; Laws, 2015, ch. 309, § 4, eff from and after July 1, 2015. In addition to any other rights and remedies which a person may have, any person shall have the right to resort to and apply for injunctive relief, both temporary and permanent, in any court of competent jurisdiction to enforce compliance with the provisions of this chapter and to restrain and prevent violations and threatened violations thereof. HISTORY:SOURCES: Laws, 1997, ch. 483, § 8; reenacted without change, Laws, 1999, ch. 302, § 10, eff from and after July 1, 1999. Repealed by Laws of 1999, ch. 302, § 11, eff from and after July 1, 1999. Any operator who suffers damages as a result of not participating as a member of Mississippi 811, Inc., waives the right to recover damages to the operator’s underground facilities from the excavator if the excavator complied with the provisions of this chapter. The provisions of this section shall not apply to any municipality, as defined in Section 17-1-1, that owns or operates a utility. Nothing in this chapter shall modify or abrogate any contractual provision entered into between any railroad and any other party owning or operating an underground facility or underground utility lines within the railroad’s right-of-way. HISTORY: SOURCES: Laws, 2014, ch. 354, § 2, eff from and after July 1, 2014. (d)Notwithstanding this subsection and subsection (2) of this section, if any violation was the result of gross negligence or willful or wanton misconduct as determined by the executive committee, the executive committee shall require the violator to complete a course of training concerning compliance with this chapter as determined by the executive committee and pay a civil penalty in an amount set by the executive committee, not to exceed Five Thousand Dollars ($ 5,000.00) per incident. (2)Any person who is required to complete a course of training under subsection (1) of this section shall be responsible for paying for the cost of the training. For those instances in which training is ordered, if the person is a firm, partnership, association, corporation, limited liability company, joint venture, department or subdivision of the state or other governmental entity or any other body or organization, the executive committee may require that at least one (1) manager or supervisor thereof attend any such training. (3)Any excavator who violates this chapter may be required to cease work on any excavation, or not start a proposed excavation, until the excavator complies with this chapter. HISTORY:SOURCES: Laws, 2016, ch. 490, § 2, eff from and after Jan. 1, 2017. (1)There is created an Underground Facilities Damage Prevention Board for the purpose of enforcing this chapter. (2)It is the intent of the Legislature that the board and its enforcement activities not be funded by appropriations from the state budget. (3)The Pipeline Safety Division will provide administrative, investigative and legal support for the board as deemed necessary and approved by the board. The Pipeline Safety Division shall charge to the board the expenses associated with the administration, investigative and legal duties requested by the board. (p)The Executive Director of the American Council of Engineering Companies of Mississippi, or his designee. (5)The initial term of the appointed members provided in paragraphs (b) and (c) of subsection (4) shall end December 31, 2017; the initial term of the appointed members provided in paragraphs (d) and (e) of subsection (4) shall end December 31, 2019; and the initial term of the representatives provided in paragraphs (g), (i) and (j) of subsection (4) shall end December 31, 2021. After the expiration of the initial terms, all appointed members shall serve a term of five (5) years. (6)The Governor shall appoint the initial chairman of the board, and the initial board shall elect other officers as the board deems necessary. The board shall meet and elect a chairman and other officers every two (2) years thereafter. The staff of Mississippi 811, Inc., shall serve as staff support for the board. (7)The board shall meet no less than three (3) times each year, with a date and time to be set by its chairman upon at least five (5) business days’ notice provided by United States mail, electronic mail or personal delivery to every board member. (8)Eight (8) members of the board shall constitute a quorum and a majority vote of those present and voting at any meeting shall be necessary to transact business. (9)The members of the board shall be immune, individually and jointly, from civil liability for any act or omission done or made in the performance of their duties while serving as members of the board, but only in the absence of willful misconduct. (10)The members of the board shall serve without compensation. (e)One (1) member chosen at large from the board from any paragraph of subsection (4) of this section. (12)A member serving on the executive committee shall be limited to two (2) consecutive one-year terms. No executive committee member may participate in a vote on any matter in which his employer is the alleged violator or has incurred damage to its facilities as a result of the alleged violation. (13)The board and the executive committee may hold meetings and vote by telephone, television, or other electronic means. HISTORY:SOURCES: Laws, 2016, ch. 490, § 3, eff from and after July 1, 2016. (a)Adopt a budget and promulgate rules and regulations to carry out the responsibilities of the board and the executive committee under this chapter. The board shall adopt its initial budget and promulgate its initial rules and regulations no later than December 31, 2016. (b)Make and enter into contracts. (d)Subject to the availability of funding in the Underground Damage Prevention Fund created by Section 77-13-35, contract with appropriate individuals, entities or agencies to conduct training and public awareness for damage prevention. HISTORY:SOURCES: Laws, 2016, ch. 490, § 4, eff from and after July 1, 2016. (1)The board shall develop and implement a process whereby upon receipt of a complaint of a violation of this chapter, the executive committee shall initiate an investigation of the complaint which may include a request that the Pipeline Safety Division designate an employee of the division who will investigate the complaint in accordance with this chapter and the rules adopted by the board. (2)Any investigator acting upon request by the executive committee may issue citations for violations of this chapter in a form and manner established by the board. Any citation shall include a recommendation for the penalty to be assessed and training to be completed under Section 77-13-27. (3)If the person to whom the citation is issued under subsection (2) of this section does not pay the citation or submit to ordered training, or both as applicable, within thirty (30) days, then the executive committee shall conduct a hearing and issue an order which includes its findings and ordered penalties. The hearing shall be held at the time and place set forth in the citation or in a separate notice of hearing. (4)A person aggrieved by the executive committee’s order may, within sixty (60) days, seek judicial review in the form of an appeal “de novo” in the Chancery Court of the county in which the excavation occurred. If the excavation occurred in more than one (1) county, then the appeal shall be conducted in the chancery court of the county where the greatest amount of excavation referenced in the citation occurred. (5)The person initiating a complaint of violation under this chapter shall submit to the board all information and documents in its possession related specifically to the alleged violation. (6)Evidence of findings of fact, civil penalties, or any of the actions or proceedings pursuant to this chapter shall not be admissible in any other civil causes of action. This chapter shall not limit any person’s right to pursue any additional civil remedy otherwise allowed by law. (7)Nothing in this chapter shall grant the executive committee or the board jurisdiction over damage to utilities located above the ground. HISTORY:SOURCES: Laws, 2016, ch. 490, § 5, eff from and after July 1, 2016. (1)There is created an Underground Damage Prevention Fund to be administered and used by the board for the purpose of carrying out its duties under this chapter. All sources of funds collected by the board under this chapter, including, but not limited to, grants, assessments, and civil penalties collected pursuant to this chapter shall be deposited into the Underground Damage Prevention Fund. Any monies remaining in the Underground Damage Prevention Fund at the end of the fiscal year shall not revert to the General Fund, but shall remain in the Underground Damage Prevention Fund for the exclusive use of the board. The expenditure of monies in the Underground Damage Prevention Fund shall be at the discretion of the board to carry out its duties under this chapter. Excess funds shall be used for purposes related to buried utility damage prevention, including, but not limited to, public awareness programs, training and education programs for excavators, operators, line locators, and other persons to reduce the number and severity of violations of this chapter. (2)The Pipeline Safety Division, with assistance from the board, shall apply for all grants, including those awarded by the U.S. Department of Transportation’s Pipeline and Hazardous Materials Safety Administration, which may be used to fund the cost of services associated with Section 77-13-29(3), and any such grants received shall be used to pay for such services. HISTORY:SOURCES: Laws, 2016, ch. 490, § 6, eff from and after July 1, 2016. Nothing in this chapter shall expand the jurisdiction of the Pipeline Safety Division or the commission in any way. HISTORY:SOURCES: Laws, 2016, ch. 490, § 7, eff from and after July 1, 2016.